What makes a symphony orchestra great? Well, yes, but according to whom? Many years ago, I was walking to my car after playing a concert as principal clarinet with a smaller orchestra. Small in that it only played a few concerts a year to small audiences in a small community, but close enough to a metro area that it could hire top freelancers, and professional musicians being what they are, the concerts were nothing to sneeze at. We had just played Beethoven’s Fourth Symphony, and the lady who touched my sleeve had something she wanted to say. “Thank you, ma’am,” I replied. “Thanks for coming, and please come back.” I knew what she meant; she had really enjoyed the concert, and she was giving me the best compliment she had. And in the heat of the moment, it really might have seemed that this performance, by an orchestra that was, by any measure except the notes in the score, a fraction of the New York Philharmonic, was just as good. Skipping forward a number of years, I was about to start my first full season playing bass clarinet with the Pittsburgh Symphony, and looking ahead on the schedule I saw William Schuman’s Symphony No. 3. William Schuman’s Third Symphony is rarely performed, and for good reason. Not because it isn’t a great work. Schuman was an eminent American composer and arts administrator who died in 1992, served as president of the Juilliard School and the Lincoln Center, and left a body of work that includes eight symphonies. His symphonies are not widely played today; they are difficult, and pithy. Stravinsky’s often-performed Firebird, say, is difficult also, but it is lush and familiar, and if you were to hear your local university orchestra perform it, you would most likely be impressed. Stravinsky, later in his life, derided Firebird as “that great big lollipop.” It’s like apple pie: there may be a best apple pie, but a wide range is acceptable, and appreciated. When you combine apples and sugar and cinnamon there’s not much to lose. If The Firebird is apple pie, Schuman’s Third Symphony is fugu: properly prepared, a delicacy for the discerning. Improperly prepared, poison. For most orchestras there is little point in challenging their audiences with a piece that is difficult to appreciate even if played well, that probably can’t be played well anyway, and that requires the expense of a whole bunch of extra players. One of my bass clarinetist friends in a smaller full-time orchestra remarked that he had played 34 years without seeing Schuman’s Third on his stand. It is a test for everyone, the audience included, and not many orchestras are willing to take it. However, all bass clarinetists have practiced it for hours and hours, because it contains what may be the most difficult bass clarinet solo in the literature. Like most of the symphony, it is harder than it sounds, requires exact rhythm, extreme clarity of tone and articulation, and considerable technical agility. It appears on almost every bass clarinet audition list, even if there is not a chance in hell that the orchestra will program it. Ever. This is one of the defining characteristics of a Pittsburgh Symphony, or a New York Philharmonic, or a Chicago Symphony, that it can program any work of quality, period. An orchestra at this level has no fear of difficulty, having invested in the best players in the world. Nobody on the artistic side ever says in a meeting, “Great piece, I just wonder if the orchestra can handle it?” If you can’t play any work in the repertoire, you don’t belong here. With a strength of 99 players, a Pittsburgh Symphony has no aversion to works that require quadruple winds. It has the length of season and variety of programming to absorb challenging repertoire without driving the audience away, and it has the type of audience that can appreciate a challenge. So, I prepared Schuman’s Third. Diligently. I’m sure my family got sick of hearing it, but there was no leaving anything to chance. There aren’t many recordings to study (did I mention that it’s rarely performed?) so I was delighted when, a week or two before the concert, I saw a post on the Internet clarinet bulletin board (clarinetbb if you want to google it) about a live streaming broadcast of Schuman’s Third, available worldwide. “Great,” I thought. “I’d love to hear a different performance.” When you see a post like this it’s a significant event. 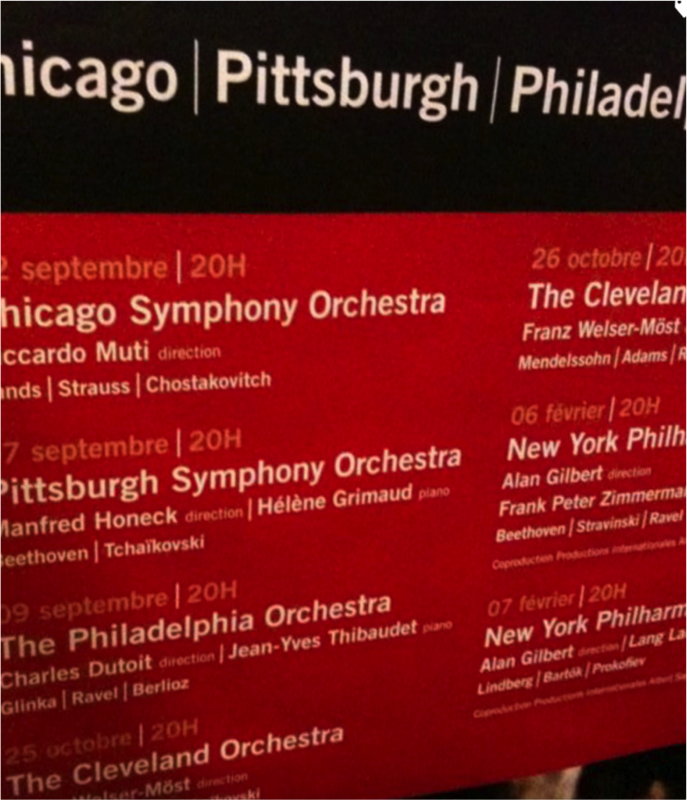 Berlin, Chicago, Concertgebouw, Boston. Worldwide broadcast, must be a heavyweight. All right, let’s see when — and whom — this live broadcast will be. Click. Pittsburgh Symphony Orchestra, Leonard Slatkin conducting. It took a moment to sink in, that I was on the OTHER side of the magnifying glass. But that is the job. A difficult modern work has been programmed because Leonard Slatkin knows the Pittsburgh Symphony can play it. The Pittsburgh Symphony can play it because it has consistently, for generations, maintained its status as a destination orchestra for the best musicians by paying enough for those musicians not only to come, but to stay. They were great players when they were in Houston, or Atlanta, or Utah or St. Louis or Montreal, but they’re HERE now. And because they have stayed, they have, together, become a mature voice, full of color and depth and character, greater than the sum of its parts. And because of this, a live broadcast of an acerbic 20th century masterpiece is news, and clarinetists around the world tune in and listen intently. An orchestra like this is one big, rolling, crucible experience. When the PSO plays, roughly 30 million dollars worth of musical instruments (paid for by the players themselves) vibrate and connect the orchestra’s collective soul to yours. Every musician has been selected from hundreds and has worked and studied, has grown stronger by living with the highest standards, and by withstanding constant, intense scrutiny. Live broadcasts, commercial recordings, tours, online archives. ‘World-class orchestra” falls easily from the tongue, but the world is listening now more than ever and every PSO musician knows it. Because of the tradition, the 120-year history, the gallery of illustrious maestros, the thousands of lives and millions of hours devoted to the art of orchestral performance, there is the concert right now that will be attended by someone who has never heard the Pittsburgh Symphony play before, and may never again, but will always carry the experience as a point of reference, so that “just as good as the Pittsburgh Symphony” will be the highest possible praise. Is the Pittsburgh Symphony a great orchestra? I shall be looking forward to hearing this, and appreciating it more. Quite right about William Schuman’s “eight symphonies, numbered Three through Ten” (Wikipedia)! I love each of the Schuman symphonies I know, and have some slight appreciation for the noted bass clarinet solo in the Third, having played clarinet in middle school and high school, to go on to a career as pianist and accompanist. Thank you for this appreciative article that does justice to a composer often maligned, yet whose stature grows with the years.